I am back with another episode of Lil Bee's Product Focus. The winner of last Product Focus is Kavya ! The stamp used on this card is from Stampavie . I have stamped it with memento ink and then colored with copics. i have then used Spellbinder's Floral ovals to partially cut the stamped image. 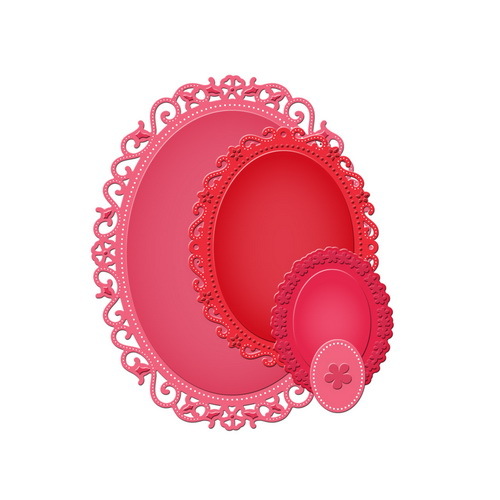 These ovals come in 4 sizes and just perfect for cards! The card base is also cut with Spellbinders standard large circles. The patterned papers is from Webster's Pages. Another product which will be available at Lil Bee's Boutique is Sospeso Trasparente and her is what i have made with printed sospeso plastic butterflies and patinas. I have created this table centre piece with 3 inverted glasses . In this next set of centre piece i have used Prima roses instead of sespeso flowers. More details on Sespeso Transperento coming soon! And now the giveaway, to win one of Stampavie products, leave your comments below as to what you color your stamped images with. Oh i loved the idea for your centre pieces so gorgeous!! !..and lovely card as well totally love the cute bear image:)....i usually color my stamped image with either watercolor pencils or markers. Inverted glass concept with flower is nice concept...i colour my stamped images with pencil colours or watercolours .. Thank you soo much!! Yay!! Love the recycling bit to the glasses!! Beautiful arrangement! !